Air valve sizing and planning is something I deal with on a regular basis as a manufacture representative for Val-Matic. Owners, contractors, and engineers don’t deal with these on a regular basis, and they want to confirm the air valves are installed and applied correctly to their pipelines. This is a quick lesson for you to understand how they work and what you need to know. Air valves are often overlooked or applied incorrectly on projects. Maybe because they are a small percentage of the overall cost or their physical size is small compared to other components on the project. They are a mechanical device operating with the fluids and pressures in the pipeline, so their are no electrical components involved and they may not seem important. However, these valves are critical to the proper operation of your pipeline and you need to understand how they work so you can economically size them to their full potential. Pipelines are used to move water from one location to another. If air is trapped in the lines when filling or trapped under pressure, it will restrict the flow of water. If air is not allowed back into a line when draining it, you can collapse the pipeline or cause a negative pressure condition that pulls things you don’t want into the pipeline. Something has to be in there! There are three types of air valves. Air Release Valve – Let out small bubbles or air under pressure in a full pipeline. Air Vacuum Valve – Let out large amounts of air when filling a pipeline, and let back in large amounts of air when draining a line. Combination Valve – Peform both operations of the above Air Release and Air Vacuum Valve. There are Clean Water Air Valves and Sewage Water Air Valves. The Sewage Water Air Valves will have a taller body and slight conical shape narrowing at the top. This keeps the debris that is in the water away from the mechanism at the top of the valve. Notice the air release on the left has a small rubber button and a link and lever mechanism. The link and lever gives a mechanical advantage to the float to allow the rubber button to pull of the orifice to allow air out when the valve fills with air. Air vacuum valves don’t need this because they don’t let air out under pressure. Val-Matic has a great “AirValve Sizing Program” that is free to use when you register online at their website. Your local representative will get a heads up from your information, and help with any aspects of the software as needed. 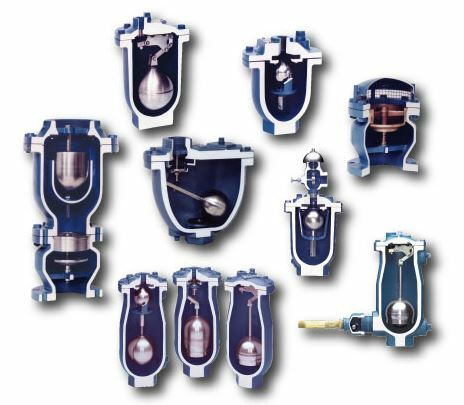 There are a host of presentations on the subject of air valves, but now you know the basics. Please let us know if you have any questions!